At this point, your phone will try to connect to the account, and you will get a warning that says "Unable to set up account: Unable to connect to server." 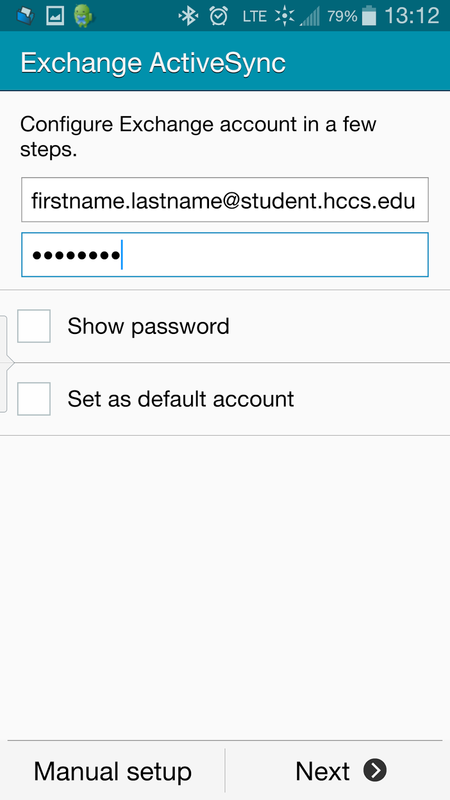 This will happen because initially, your device will try to connect to student.hccs.edu, which is not the Exchange server that you want to use (see Step 6). Step 7: Under Domain/username: put "AD\w#########", the W######### being your student ID number. I'm not quite sure what the AD is, but I found that on the link above, and it worked for me. In case this doesn't work for you, I'll try to research more into it and find out the write letters for you. Also, pay attention to the slash [ \ ] , it's not a backslash [ / ]. 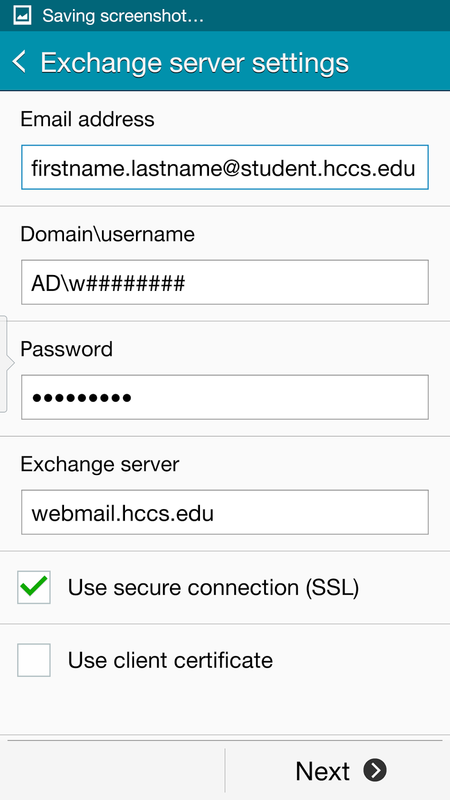 Step 8: Under Exchange Server: change it from student.hccs.edu to "webmail.hccs.edu". You're only changing the part that says student to webmail. Step 9: Keep the check mark on "Use secure connection (SSL)". Leave the "Use client certificate" unchecked. The next screens may take a minute or so to connect to the server. Just continue to click next and agree to whatever popup shows up on your phone. Not only will this allow you to sync your Student WebMail's inbox, it will sync your created folders, drafts, sent items and deleted items as well. This will also sync your calendar events, contacts, and tasks by default. Keep an eye on those in your Calendar and Contacts apps. If you do not wish to sync your calendar and contacts, simply go to Settings - Accounts - Microsoft Exchange ActiveSync - your Student WebMail account - and uncheck "Sync Calendar" "Sync Task" and "Sync Contacts". What about IMAP, POP and SMTP Access? I don't think HCCS provides any information on this at all on their WebMail. Yes, there is a link under Options about it, but the information regarding POP, IMAP, and SMTP says Not Available. As far as I know, there is no way to retrieve your email using POP or IMAP. I hope this blog post helps! I'm also hoping that this helps me in my future adventures in college. If you have any questions, feel free to leave me a comment or send me an email. Thank you! now i can get emails from the school without having the hassle of them not REPLYING to me. They're awful at emailing students unless they have the outlook webmail account. This is a great help! I am glad to be of help! Thank you for visiting my site.